In order to meet its customer’s requirements, FPD required a machining solution that could provide enhanced productivity and part quality, finishing the entire outside surface of the component more quickly, efficiently and accurately, in just one operation. While most manufacturers employ grinding processes for this type of part in order to achieve the desired surface finish, FPD understood that grinding can also lead to inaccurate geometries. 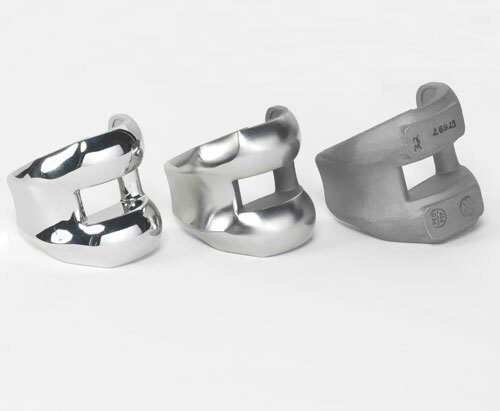 As such, the company chose to pursue a milling solution that would provide both feature accuracies and surface finish. Having worked with Makino for several years, FPD employed the company’s turnkey engineering services to develop a complete manufacturing solution, including machining center, optional equipment, tooling, work holding and programming. The solution was an a61 horizontal machining centers equipped with a Parlec tombstone featuring quick-change tooling plates and several options, including Makino’s Super Geometric Intelligence, to ensure proper machining of the component’s complex geometries. With the technical know-how from FPD’s engineering team and Makino’s application engineers, the company used the a61 to produce the required ±0.0005 inch profile and ±0.0025 inch datum tolerances. The fixturing system allowed for up to eight parts and six part sizes in a single setup. Completed components were hand-polished to a mirror-like surface of 4 Ra or better. By investing in an accurate and efficient production system, FPD has been able to meet and exceed its customer’s on-demand production needs, delivering finished components on time, every time.